"The World of Krypton" - Part 5: "Fortitude"
Straith, first Knight of the Pax Galactica, slaps Superman on the back and asks if the Man of Steel would like to surrender before his comrades kill him in battle. His comrades, consisting of Seamus, Ordling and their leader Lourdes, banter back and forth before Superman attacks again. The fight is short lived as the true enemy, Lexus, finally arrives. Lourdes and her men surge towards the giant creature but when Superman sees the energy blast Lexus is firing after them he flies off to put himself between the blast and the warriors. The green rays injure him but Superman finally figures out that Lexus is a creature of magic, not technology. Lourdes reveals Lexus' origin; he was once her twin brother. Some sort of evil had infected his heart long before he started practicing the dark arts. Eventually he grew too powerful and became a threat so their father killed him and cast his son's dark heart into space. Evil, like energy, cannot die and over time he cloaked himself in the very planets he destroyed. After hearing Lourdes' story Superman tells her he knows what to do, grabs her sword, flies into Lexus and pierces the creature's heart. Superman informs him that without a vessel for his hatred and rage Lexus can no longer affect the universe around him. As Lexus explodes Superman grabs the warriors and flies them towards the moon. There they all bow before him and proclaim him their liege. In destroying Lexus he has become the undisputed ruler of the Pax Galactica. They are duty bound to obey his every command. Superman's first and only command is for them to go home and find another quest. 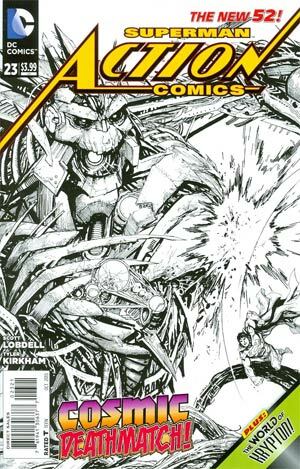 Story - 4: As with the first chapter this was a breezy, mostly fun action piece that serves mainly as a fill-in until the powers that be can get a regular writer on ACTION COMICS. There wasn't a whole lot to it but that isn't a bad thing. Lobdell crammed a lot of graham into this story and it was refreshing to get an entire story, complete with villain origin and everything, in a couple of twenty page stories. It was a little jarring actually because when I read current comics I expect more drawn out storylines. Here we were in and out in two months and I appreciated that. The strength of this issue was that for the most part Superman was the straight man. Lexus, Straith and the others were played for laughs with Superman being the one that had to not only deal with the situation but has to suffer these fools, especially at the end. Lobdell continued with the characterization of Superman from the last issue as a man of action that just wants to deal with the situation at hand and go home and this time out I liked that. I will admit that I was a little uncomfortable with Superman grabbing a sword and killing Lexus but I won't go into that for two reasons. One; I think Lexus would certainly fit into the undead category as he was killed and came back to life. Two; I am pretty sick of the whole "Should Superman Kill?" debate and discussing this might bring that angry mess back to life. I want no part of that so I will simply sit back and appreciate a direct, no-nonsense Superman that saw a problem and handled it. My only problem with the issue and the story as a whole was the mixing of genres. I am not a huge fan of magic and mystery type fantasy stories nor am I really all that into science fiction and with this two-parter Lobdell brings both together. This is nothing against Lobdell as I think he succeeded in mashing the two ideas but for me they are not two great tastes that taste great together. That is a personal thing on my part and has nothing to do with the writing. Magic based stories, which is what ATOMIC KNIGHTS turned into, are not my cup of tea. They rely heavily on things just happening to work and we get that here with Superman just knowing that if he kills the heart it will destroy the creature. There is a certain logic to it but it's a thin logic. Again, it doesn't destroy the story for me but it did rub me the wrong way. Other than that this was a fun piece. I have to admit that I chuckled a bit as Lourdes and the others bowed before Superman and asked what his first command would be. I liked that his response was to tell them to leave and we get the little exchange on the final page. It was a bit much but at the same time it wasn't a terrible note to leave on. 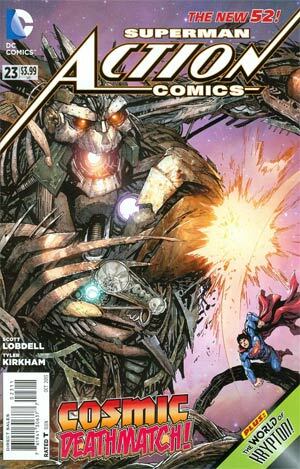 Art - 4: Despite Superman looking wonky from time to time the art in this story was fantastic. Tyler Kirkham brought a lot of energy and life to this two-parter and was the main reason I enjoyed the story as much as I did. His page layouts were exciting and while the backgrounds were a bit sparse he threw a lot of detail into the characters, especially Lexus. The mostly two page spread where Lexus is finally revealed was fantastic. I wrote this last time and I will write it again; I want to see Kirkham on a Superman book full time. When Lara's attempts to quell the Colonel's uprising end in failure all that stands between Krypton and destruction is Jor-El. For his part Jor-El refuses to help the Colonel and gives a speech about how Krypton is more than just a planet, it is an ideal. The Colonel back hands Jor-El and is about to execute him when suddenly a blast from behind ends the Colonel's machinations and the Colonel himself. Order is quickly restored and Jor-El destroys the machine that would have spelled doom for Krypton. With that done Jor-El introduces Kra-Hu to Commander Zod, an old childhood friend and the man responsible for quelling the insurrection. Story - 2: This ending wasn't bad but I still didn't care for this resolution or the story as whole. The plot was solid and I like the idea of Jor-El, Scientist of Action, fighting against an insurrection on Krypton but the serial nature of the story led to a very disjointed read. I am curious to see what it would look like in a collected edition as there isn't a whole lot of connecting tissue between the chapters. My main problem this time was with is with the ending. The writer built to the moment where Jor-El and the Colonel are face to face and in the end it isn't Jor-El that defeats the villain but rather a character that seems to come from nowhere and delivers the killing blow. He's in shadow so you know he's supposed to be somebody important and everything leads up to Jor-El introducing his old friend Zod. The old friend that hasn't been mentioned once (unless I just missed it) through the course of the story. It was a solid moment but one that didn't have any soul to it because there was no build up to the final page. It just happens and we as readers are supposed to think it's cool because that's Zod and Zod is going to end up as a bad guy but here he is shaking hands with Jor-El and isn't that freaking cool to see? Not to me. Your mileage may vary and I don't want to ruin anyone's fun but for me this was a lackluster ending to a mediocre story. There were some bright spots and there were some good ideas but on the whole I really didn't care for it. Art - 4: My reaction to the art in this story was the exact opposite to that of the writing. I loved it. This version of Krypton is very dynamic and looks great. While the writing was a bit jarring the art hit all the right beats. Kra-Hu looked a little odd but then again he was the only character without some sort of headgear so that might play into that feeling. Overall I really dug the artwork in this story. I just wish the writing had lived up to it. Cover Art - 4: At first I wasn't all that hot on this cover. Superman is very small in the image, which seemed odd to me but when I gave it another look I realized this was what Kirkham was going for. Superman was supposed to be small in the frame to show how large Lexus really was. Lexus looks fantastic as well. Again, the level of detail put into this character was great. This was a really solid cover. Variant Cover Art - 4: Without the color the details on this cover stand out. I won't go into that too much because I have harped on it enough but once again the black and white variant is my favorite because you can see the work that was put into the image without the color effects.